Glass Agencies EROSE are manufacturer of Hydrocullator. 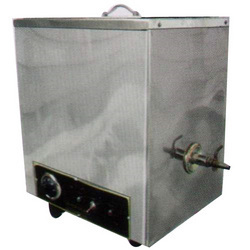 Our organization is well known in the industry for catering a distinguished segment of Paraffin Wax Bath. These products are made from high quality components. - To use to warm the water at a specific temperature of 100° F to 110° F.
- Daul chamber made of stainless steel and mounted on a M.S. Frame fitted heavy duty casters. - Faciliate to set the temperature thermostatically up to 100° C.
The benefit of moist heat treatment for arthritis, bursitis, muscle spasm, back pain and joint stiffness is recognized by leading medical and sports training experts everywhere. However, the biggest challenge has been heating your heat pack to the right temperature quickly. That’s where the HMSHYDRO Heating Unit comes in! - Very effective for moist heat therapy application. - Inner & outer construction stainless steel. - Sturdy base, mobile on castors. 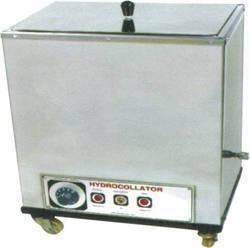 we are manufacturer of Hydrocollator Four pack.Hydrocollator is used in electrotherapy.